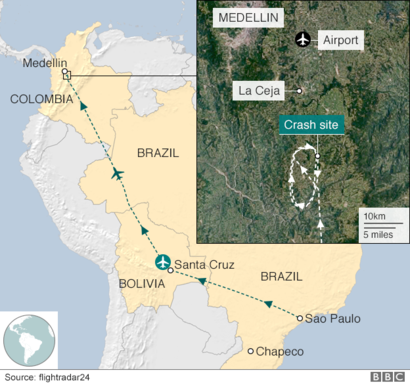 The plane which crashed in Colombia killing most of a Brazilian football side had run out of fuel, according to a leaked audio recording. A pilot can be heard repeatedly requesting permission to land due to an electric failure and lack of fuel. The team, Chapecoense, had been due to play a cup final in Medellin on Wednesday evening. Fans instead gathered to pay tribute. Thousands of people carrying candles and wearing white filled the stadium where Chapecoense was to have played Atletico Nacional. At the same time, Chapecoense fans held a tearful vigil at their home stadium in Chapeco, Brazil, which was draped in black ribbons. Both stadiums were filled to capacity. 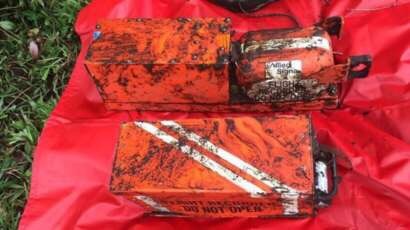 The pilot and can be heard warning of a “total electric failure” and “lack of fuel”. That there was no explosion when the plane came down also points to lack of fuel, with one Colombian military source telling the AFP agency its absence was “suspicious”. Chapecoense were flying to Medellin for what would have been the biggest match in their history – the final of regional tournament the Copa Sudamericana. Among the survivors, Chapecoense said that two players remained in a critical but stable condition, while the club’s goalkeeper had had one leg amputated and might still lose his other foot. “We’re very anxious for the arrival of the bodies, to give them a last tribute, which they deserve. The city has stopped, waiting for that moment to come,” said one supporter. Many of football’s most famous names, from Lionel Messi to Pele, have offered condolences.